1500 watt DC to AC power inverter has high conversion efficiency with pure sine wave output, optional input 12/24/48 volts and output 110/120/220/230/240 volts, 50/60Hz, universal outlets and USB port to meet your multi-purpose charging, safe charging desigh to protect your device. Favorable price pure sine wave power inverter provides 300-Watt continuous DC to AC power DC 12/24/48 volts input, and AC 100/110/120 Volts, AC 220/230/240 Volts output, 50/60Hz for your selection, with full safety protections and digital LED display. 500W power inverter outputs pure sine wave, has universal selections of DC input 12V/24V/48V, and AC output 100V/110V/120V/220V/230V/240V, 50/60Hz, ideal DC to AC inverter for car and home appliances like microwave, refrigerator, TV, computer, etc. 2500 watt pure sine wave power inverter are available for input DC 12/24/48V and output AC 100/110/220/230/240V for your choice. Durable aluminum alloy housing, LED display, intelligent cooling fan, built-in fuse provide a multi-protection for powering your devices. High efficiency and powerful pure sine wave inverter, 6000W continuous power and 12000W peak power, 12V (optional 24V/48V) to 110V or 220V (optional 120V/230V/240V), durable aluminum alloy housing, built in fuses and intelligent cooling fan, providing full safety protections. Powerful pure sine wave inverter provides 1500 Watts continuous DC to AC power, up to 3000 Watts peak power, which can be used for car and home, such as charging cell phone, lights, TV, computer, fan, refrigerattor, washing mashine etc. 1. Both are voltage inversion. The inverter and the converter have the same function and both are to realize the voltage inversion. 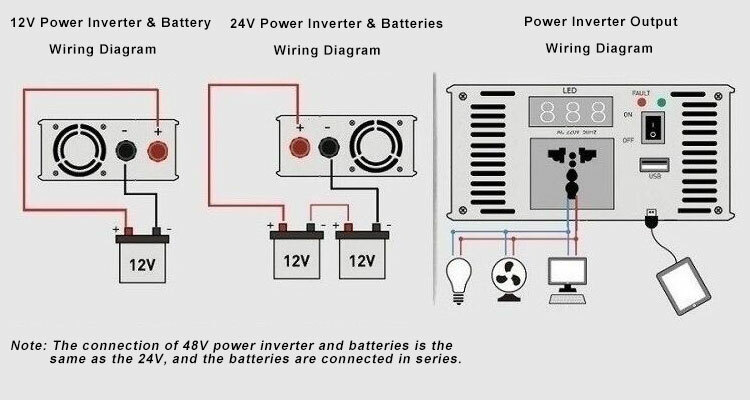 The inverter converts the 12V DC output from the battery to high-frequency, high-voltage AC, while the converter converts the AC voltage of the grid into a stable 12V DC output. Both of them use pulse width modulation (PWM) technology, and the core part is a PWM integrated controller. Although inverters and inverters are to achieve voltage inversion, but the former is to convert low-voltage DC into high-frequency high-voltage AC, while the latter is to convert AC to DC. The inverter uses the chip with operating voltage range of 3.6V-40V, and the internal also set the regulator, error amplifier, oscillator, short-circuit protection circuit, low voltage protection circuit and so on. But the converter is different. Works great as expected. I use this item in my car for running my laptop and phone and it does a good job. Really recommended.